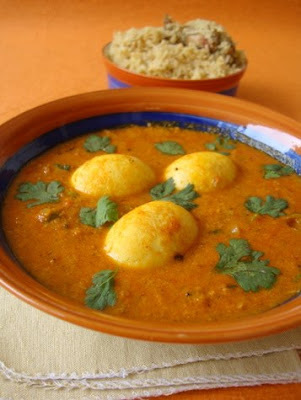 Discription:Despite all of the mesmerizing flavors of egg masala, the key factor that really put it over the edge was the ground paste made from ordinary ingredients like poppy seeds, coconut and curry leaves! Addictive taste, warming and satisfying! Serve with rotis, rice or pulao. Heat 2 tsps oil in a heavy bottomed vessel, add the boiled eggs and saute of low to medium flame for 2-3 mts. Add a pinch of turmeric pwd and combine. In the same pan, add the remaining oil and add the cloves, cinnamon, elaichi and star anise and mustard seeds and saute for a few secs till the mustard splutters. Add chopped onions and saute till onions turn transparent. Add ginger garlic paste and saute for 4 mts. Add chilli pwd, coriander pwd and salt and combine. Add the tomato puree and cook for 3-4 mts. Add the ground paste and cook for 8-10 mts. Add 1/4 to 1/2 cup of water and bring to boil. Add the boiled eggs and let it cook in this masala for 7-8 mts on medium flame. Reduce flame and cook till you get the desired curry consistency. Add garam masala pwd and combine. Turn off heat and serve hot with rotis or white rice.